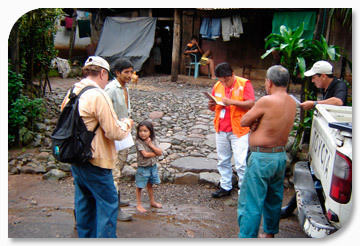 National-level health response teams are comprised of professionals of various health backgrounds that has been organized and trained in advance. These teams can be rapidly mobilized to emergency areas to support the efforts of local health authorities in activities such as sectoral damage assessment and needs analysis (DANA). They can also propose and support action to strengthen the health response, facilitate intersectoral coordination, and help meet other needs that arise. An NHRT should have contingency plans that clearly set out procedures, protocols, and lines of action for emergency interventions. The mobilization of personnel and equipment needed for the work as well as the evacuation of the injured, the relocation of populations affected by the disaster, and a plethora of other urgent needs require a logistical system if they are to be carried out efficiently. Therefore, it is important to designate a logistics team to support the NHRT. The logistics team will be responsible for identifying, preparing, and planning for the areas that require support, identifying the resources that will be drawn on, and the methods and procedures that will be used to mobilize and manage the resources.